← How to use doc2any from a Windows Service? I cannot find the Documentation for the PDF Viewer OCX. My company is looking at purchasing and using this control however I need to be able to get the Free Trial working first to prove it will do what we need. then you can C++, C#, VB, HTML, etc. sample projects test PDF Viewer OCX easily. 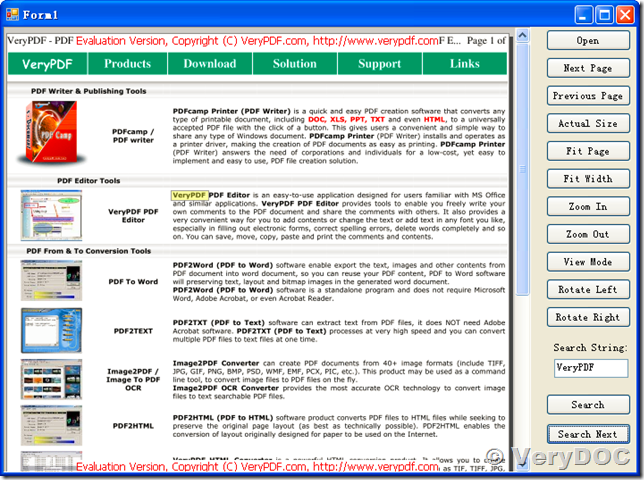 Description: Open and close PDF Viewer window. Description: Search text string in PDF pages. Description: Move between PDF pages. Description: View PDF pages in different modes. Description: Show or hide bookmark window. Description: Set License Key to PDF Viewer OCX. If you encounter any problem with PDF Viewer OCX (PDF Reader OCX), please feel free to let us know. Embed PDF Reading into any Windows Form App. Add PDF display capability to your VB, .NET, or Delphi application. Host Adobe Pdf Viewer Read-Only Disable Save, Print, HotKey, Memu. 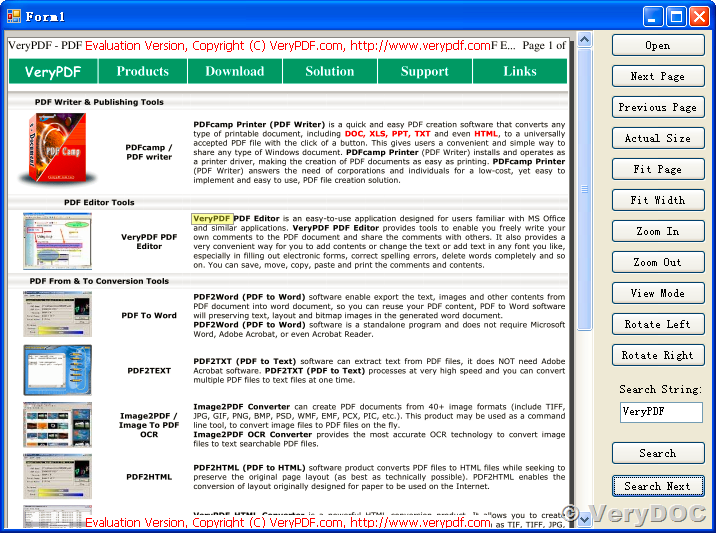 PDF Document Reader SDK for Programmers, Load, Read, Parse, Extract PDF Documents. How to open and view a PDF file from internet? How to enable and disable Context Menu in PDF Viewer ActiveX (OCX) Control? How to use PDF Viewer OCX (ActiveX Control) to view the PDF file from memory? How to display PDF in browsers without Acrobat plug-in installed? This entry was posted in PDF Viewer OCX Control and tagged pdf reader ocx, pdf viewer ocx. Bookmark the permalink. hi, I downloaded the trial version of your product. where can I find the related technical documentation? PDF Viewer OCX Control is contain following methods, you can call them from .NET or other program languages easily.